The Order of Service is a very important booklet, it is a piece of the funeral which people can take and keep and is an emotional and significant keepsake. 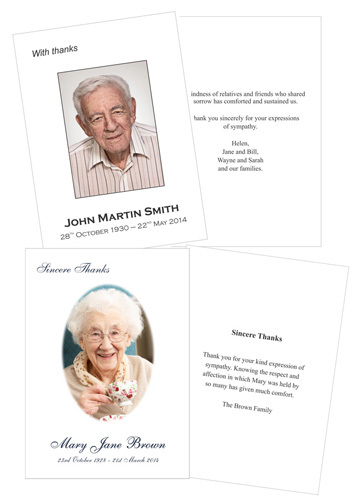 The booklet can be sent to those who could not make it to the funeral. 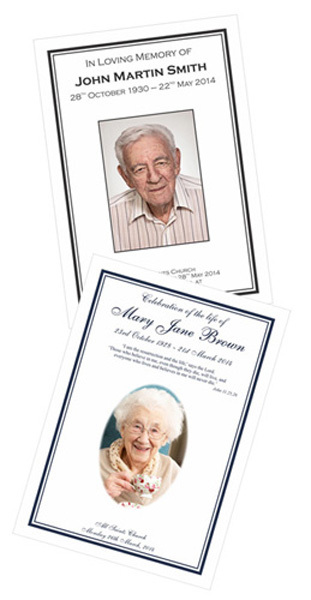 At South East Printing we understand that there may not always be a lot of time to produce the Order of Service and we will drop all other work to ensure that you have the booklet in time for the funeral service, no matter how small or large a quantity you require. If you want something other then or in addition to a booklet, please talk to our designer and we will be happy to help. It may take some weeks to receive the messages, flowers and cards of condolence for your loved one so don’t rush into ordering your cards. Take time to consider what you want to say in the card or browse through our suggested wording. Once you think you have sorted out the amount, simply talk to our designer about the Return Thanks (Sincere Thanks) card you want. We will have them ready for you in 2-4 days after the artwork has been approved.